Tadaima! I'm back. It's been weeks ever since I finished a wallpaper. This wall is for My-Maiden's winter contest and Wings-Lovers (unexpected, because of the cranes) I badly wanted to make a Japanese theme wall with pretty kimono. I used camellia flowers to show winter since it can bloom during the harsh winters. So... have you seen this scan?! I chopped a lot of parts to make this wallpaper. Sakura-chan is from this scan and the body from this scan. The background, the window came from xxxholic scan, the tree from ccs scan, the flowers from X/1999 and vectored the cranes from a stock in DA. I wasn't able to find kimono patterns with Tsubaki (most are spring & autumn theme) so I vectored my own pattern. One reason why I couldn't finish this soon is because of the background. I really had to redo a lot. To be honest, I still have doubts about this bg. I was greatly inspired by Sakura-Dust's "Passionate Red...sin of the Lycoris" so I added vectors of cranes and the window (or maybe I just randomly placed it). Comments & faves are greatly appriciated. Awww, isn't she cute? I love the colors and the BG looks nice, too. Though I wish shadows in her hair were more pronounced and those in her kimono more blended. Love the the theme and the texture. the kimono is really beautiful. Aww! 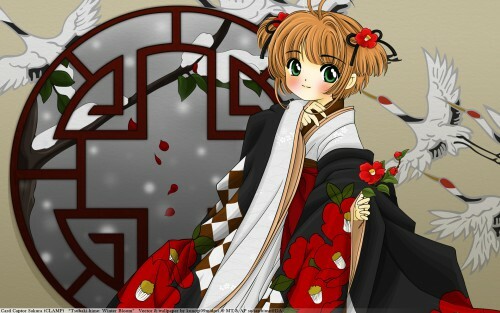 This is so beautiful and Sakura is soo cute in this pic. I love how you chose the colors. Its so christmasy. The colors are perfect for a winter wall, and as usual your vector is stunning. You do a great job of combining several scans to make one picture, it's awesome. You love using texture, which I adore, I actually have origami paper like the white pattern you used. ^_^ Very nice work. I'm not sure I'm a fan of the texture you used over Sakura's face. I think that one's better off remaining strictly on the wall. Nice! i love how you did with those scans putting it into a 1 whole wallie. Commented and +fav in AP! wow! Sakura is so sankyuu! sakura sakura sakura! Let me say this: THIS is how you vector, people! <3 Rather than simply retracing a single scan, you've done what I love: taking advantaging of being able to mix different scans and merge them together to create something unique! I would have liked to see a texture on the back wall to add more depth, and the window is a bit too blurry, but overall it's very lovely. I really like that you used a subtle origami paper over the light area of Sakura's outfit. The colors work very nicely as well for being a winter-themed wallpaper.